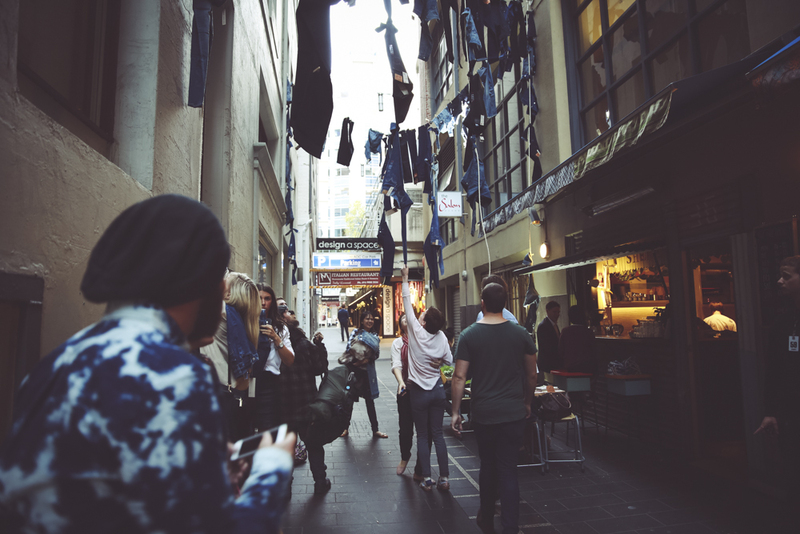 Levi Strauss contacted JCH Event Solutions in relation to doing a ‘fun, effective, interactive’ denim installation in a Melbourne CBD laneway. It was to be an evening cocktail event with many celebraties and key Levi stakeholders in attendance. It was to commence in the laneway and move into the nearby venue. The ‘obvious’ technical played second-fiddle to the styling and event logistics on this event – trying to replicate the clients creative ideas was the key. To take the clients creative and turn it into a stylish reality – installing the laneway denim laundry! Rigging and OH&S requirements of what was effectively a 7m high outdoor ‘art’ installation. Moving head FX lighting in the laneway which interlaced the styling and the technology for greater impact and guest ‘wow’ factor. Static, precise, colour corrected lighting and rigging inside the venue for the very busy activation area. Project Management which worked closely with the client and key personnel of not only the venue but other laneway properties to ensure it was a stress-free event for all concerned. Extensive documentation needed to be produced by JCH Event Solutions to ensure that the public access laneway met strict OH&S requirements during the installation and removal of the ‘denim laundry’. This management was a specific and integral part of the event. All-terrain motorised scissor lifts worked at the 7m height throughout to deliver the creative vision while crowd management was constant and precise below. The event was designed so guests could in fact ‘steal’ the jeans! Consideration to rigging weights, clothesline thickness, peg durability and the way downward strands of jeans would interlace so as jeans still positioned at 7m would come free was a pre-production engineering feat fit for NASA……. and JCH Event Solutions. As residential properties line the laneway on both sides moving head lights were programmed very carefully outside to ensure no inconvenience was incurred by tenants throughout the event. While inside precise, even, colour corrected static lights washed the activation (sewing) area. Rigging needed to be weighted carefully and lights positioned suitably to not only ensure work could be done but the high guest volume was safe also. The event was hugely successful with everybody having a great evening and embracing the unique concept. Levi Strauss staff were wrapped with how their creative imagination was brought to reality and how all aspects of the evening ran so flawlessly.